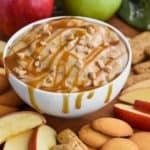 This Caramel Apple Dip Recipe is the perfect easy appetizer for a party! It is only four ingredients and comes together in under 10 minutes. This caramel apple dip with cream cheese and powdered sugar gets an extra boost of appley goodness from some apple butter, making it the perfect fall recipe! Beat all of the ingredients together. Chill for two hours in the refrigerator. When serving, add additional caramel sauce to the top and toffee bits. Serve with crackers and apples! I used caramel topping, found near the other ingredients to make an ice cream sundae. You could also use just regular caramel sauce, or make your own caramel sauce. Just make sure it is room temperature when you add it.